Health Canada says its scientists are reviewing hundreds of studies used during the approval process for glyphosate, the active ingredient in Canada's most popular herbicide, Roundup. Health Canada says in light of "troubling allegations," its scientists are reviewing hundreds of studies used during the approval process for glyphosate, the active ingredient in Canada's most popular herbicide, Roundup. 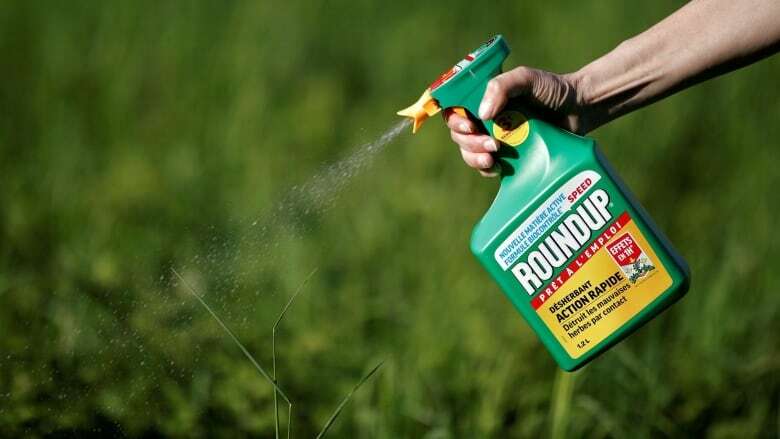 The decision comes after a coalition of environmental groups claimed Health Canada relied on studies that were secretly influenced by agrochemical giant Monsanto, the maker of Roundup, when it re-approved use of glyphosate in 2015 and confirmed that decision in 2017. The coalition, which includes Equiterre, Ecojustice, Canadian Physicians for the Environment and others, says academic papers looking at whether the herbicide causes cancer were presented to Health Canada's Pest Management Regulatory Agency as independent, when in fact Monsanto had a hand in writing them. At the time, Health Canada decided the risks of glyphosate to human health were acceptable, if used as directed in updated product labels. Now it's taking another look. "Health Canada scientists are currently reviewing hundreds of studies to assess whether the information justifies a change to the original decision, or the use of a panel of experts not affiliated with Health Canada," the health agency told CBC-Radio Canada in an email response to the coalition's claims. But Sidney Ribaux, the head of Equiterre, isn't satisfied. He says Health Canada should launch an independent review immediately and suspend use of glyphosate, which is commonly applied to corn, soy, wheat and oats, as well as chickpeas and other pulses. "This does not in any way meet our demands. Health Canada approved a dangerous product based ... on these studies." The coalition's contention that Monsanto had an uncredited role in producing some of the studies comes from court documents made public in the case of Dewayne "Lee" Johnson. In August, a California jury ordered Monsanto to pay Johnson $289 million US in damages after the former groundskeeper alleged Roundup gave him non-Hodgkin's lymphoma, a type of blood cancer. He was diagnosed in 2014 at age 42. A judge upheld the verdict last month, although Johnson's payout was slashed to $78 million US. The documents filed in the case, including emails between Monsanto and scientific experts, have become known as the Monsanto Papers. The revelations they contain have received worldwide attention. The coalition of Canadian groups says those documents prove that important scientific studies were either co-written or reviewed and edited by Monsanto without properly disclosing the company's role. "Monsanto has been playing around with scientific studies," said Equiterre's Ribaux. "[It's] making these studies look like they are independent, when in fact they were written or heavily influenced by Monsanto. "What we found is that some of these studies were key in the Government of Canada's decision to give a permit to Monsanto to continue selling glyphosate in Canada. "Obviously this is very problematic." In a statement to CBC, German-based Bayer AG which now owns Monsanto says it has an "unwavering commitment to sound science transparency" and did not try to influence scientific outcomes in any way. The company says in each case where it sponsored a scientific article, that information was disclosed. Lee Johnson, the plaintiff in the landmark American case, wants to see glyphosate research re-evaluated and expanded. "Hopefully the conversation is big enough to where they have to do more testing, more research," Johnson told CBC-Radio-Canada in an exclusive interview during a recent visit to Toronto. Johnson said he was thrilled to win his suit, but he knows his fight is far from over. He expects years of appeals. I'm not scared to die. You know, but if I have to die, at least I'll die for something. Bayer has already announced its intention to appeal the ruling. Bayer now faces more than 8,000 lawsuits in the U.S. over its glyphosate-based products. In a post on its website last month, Bayer said it continues "to believe that the liability verdict and damage awards are not supported by the evidence at trial or the law." The company told CBC-Radio Canada "its product is safe and has been used successfully for more than 40 years." It also says there is an extensive body of research on glyphosate and glyphosate-based herbicides, including more than 800 studies required by regulators in Europe, the U.S. and elsewhere, that confirms these products are safe when used as directed. Many government regulators, including the U.S. Environmental Protection Agency in 2017, have determined there is no conclusive link between glyphosate and cancer. But the World Health Organization's International Agency for Research on Cancer concluded in 2015 that glyphosate is a probable carcinogen. Johnson, who sprayed Roundup and a similar Monsanto product, Ranger Pro, as part of his job as a groundskeeper at a San Francisco Bay Area school district, says he has found a certain consolation in his struggle against Monsanto. "I was there to defend the truth," he said. "I'm not scared to die. You know, but if I have to die, at least I'll die for something."